This is the question I hear after I tell people that I feed my dogs raw. Raw what? Well, to put it simply, I feed my dogs what is affectionately known as a BARF diet, which stands for bones-and-raw-food. Things like raw chicken necks and whole eggs with the shell. Chopped up beef heart and trachea and incredibly smelly tripe. Long, tough turkey necks, whole raw fish, head, eyeballs and all, and chicken backs ground or chopped up. Occasionally a thick chicken leg or thigh-bone will make it into the mix, as will dollops of plain yogurt, drizzles of salmon oil and a sprinkling of powdered vitamins and minerals. For treats they get raw marrow-bones. And once the marrow is sucked and licked out, I stuff the bones with peanut butter and freeze them. I started feeding raw when my two-year-old brindle male bull terrier, Beckett, just couldn’t seem to tolerate any dry kibble food. Everything would be fine for a couple of weeks, and then he would have gastric distress from one end or the other. We tried all sorts of kibbles, from chicken based to lamb, beef only and ones with rice or sweet potato, expensive ones and cheap ones. Not only did his body seem to reject them, but he didn’t even want to eat. He would walk up to his dish, take a whiff, and then literally back up like he was disgusted or appalled. David liked to say he acted like it was radioactive. My friend Pam told me about raw food; I was ready to try anything. I was counseled to gradually transition. Perhaps first offer a small ½-cup serving of raw chopped chicken backs or minced beef with bone. I got a hold of a ground chicken and bone mixture from Oma’s Pride, a company that specializes in such food. Beckett gobbled it up greedily, licked his lips and looked at me as if to say “You finally figured out what to feed me!” I gave him some more. Next day, pee and poop were normal and so I decided to be brazen and not gently transition at all, but just go with raw meals from then on. The kibble was thrown out. He gained weight. His muscle tone and coat greatly improved. He loved his meals and looked forward to them. I never had another dietary related problem with him, ever. When Beckett was five years old, baby all-white Hope came into our lives. She was to be my son Freeman’s new show dog. She had been weaned on goat’s milk and kibble when she came to our house at 8-weeks of age. The breeder and co-owner, my very good friend Marion Dussault, knew I would be feeding her raw. Marion co-owned Beckett too, so she knew about how favorably I thought of the diet. Although we worked together in the dog world and saw eye-to-eye on most everything, feeding the dogs was the one area where we had different approaches. She had been breeding, and feeding, bull terriers for over 30 years on kibble, yet I was the one who had solved Beckett’s dilemma and so we sort of agreed to disagree. I brought Hope home and as I faced giving her her first meal, it occurred to me that I began feeding Beckett raw at age two, and I had no idea what to do with a young pup. I called Marion, who, remember, had no experience with the raw diet. “What should I give her?” I asked. I hung up the phone and thought about what I was about to do. Beckett is a big burly male and I never worried about him choking, but this was a baby! I decided I would sit on the floor, grasp one end of the chicken neck tightly in my hand and offer it to her, making sure that she chewed and swallowed before getting more. Not only was she a puppy, not only was this going to be her first raw meal, but bull terriers are known for gulping and swallowing things whole, so I had to be cautious. She was sitting at my feet, watching me get a bowl of chicken necks out of the refrigerator. She seemed to be full of anticipation, although I don’t think she had any idea about what was to come. That aside, I am sure that canine nose was offering some clues. I grasped one chicken neck and held it out to her. She grabbed the end and started chewing it excitedly. As she worked her way down the neck, I slowly let go of my end. She ate the first neck in about 5 seconds. No choking. She looked like she wanted some more. I offered another and the same process ensued. Again and again I handed her a chicken neck and one by one she gobbled it down, looking for more as she finished. I could hear Marion’s voice in my head: “Give her as much as she wants,” she had said. So I kept going. Hope kept looking expectantly for more. Her belly, and I am not exaggerating, literally expanded before my eyes, She was looking quite full. It looked kind of cute, but a bit distressing. Something told me this was wrong. Feed her as much as she wants? She didn’t show any signs of stopping voluntarily. I called Marion. “You did what?” she screeched in the phone. If you know Marion, you know she can screech. “I gave her 20 chicken necks,” I responded meekly. “Twenty? Twenty? She is going to explode!” Marion exclaimed. I felt bad. Did I just ruin our new show dog? Uh oh. I said this to assuage Marion’s fears as much as to convince myself that this were true. I reasoned that time would tell and there wasn’t anything we could do now. Hope seemed no worse for the wear. I went to bed, she slept soundly in her crate and I watched anxiously as I took her for the morning walk. She peed. She pooped. Everything “came out fine”, as they say. I called Marion and told her the good news. She didn’t believe me. She really didn’t believe me. But I knew the truth. Hope was okay and she seemed to love her raw food. She too never did “transition” as much as just jump in with every canine and incisor. Every meal became an exciting twice -daily ritual and Hope is simply the best eater that I have. Hope was three-and-a-half years old when she had her first litter of puppies. “I want to raise the puppies on raw,” I told Marion. She reluctantly agreed. The two boys and four girls suckled on Hope for a few weeks. It was time to offer them some alternative foods. This was to be yet another raw food milestone. Neither of us had ever fed two-and-a-half week olds raw food. 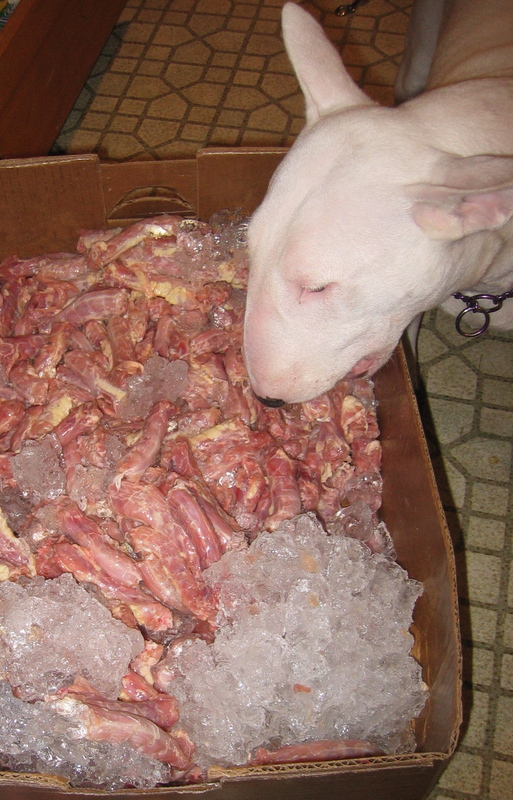 I queried my fellow bull terrier breeders who fed raw and decided that their first meal was going to be goat’s milk with minced beef and beef organs. I was so excited; I got the camera ready. I made sure the beef mixture was room temperature. I warmed the goat’s milk and combined the two. I placed the concoction in a low, wide bowl. Marion yelled at me and told me the beef wasn’t fine enough and that they would choke. I dismissed her and then a second later remembered that she had been raising bull terrier pups for over three decades and that this was my first litter. I used both sets of fingers to make sure that the beef was as finely mashed up as possible and thoroughly combined with the milk. David pointed out that this was a kosher nightmare. As Marion placed the bowl down in their whelping box, I had the camera at hand, ready to record this momentous meal. I snapped away as all six puppies descended upon the bowl. They loved it. I got pictures of them gulping away. Pictures of them trying to climb into the bowl and an adorable shot of one of the girls bracing her back legs so staunchly, thrusting her head into the bowl with such force, that you would think she was trying to eat her way through the stainless steel vessel. They all came up smiling with bits of food here and there on their faces and milk smiles, just like in the ad campaigns. Marion actually muttered out loud that I better wipe off their faces before Hope got a whiff and tried to eat them. I think she was half serious.